As the window of time for bringing new chemical products to market continues to narrow, it is increasingly essential that the process of commercialization (bringing a chemical from an R&D lab to the market as a product) be completed as quickly as possible. Complying with TSCA Inventory Requirements is a how-to book that succinctly delivers the relevant information about the Environmental Protection Agency’s Toxic Substances Control Act to chemistry professionals working in a corporate environment. 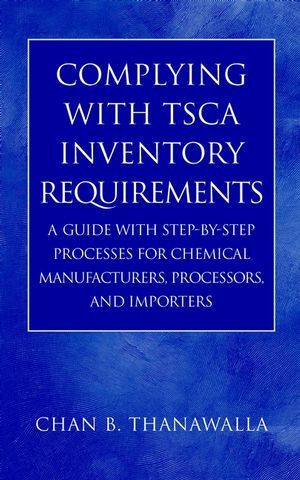 Author Chan Thanawalla provides step-by-step directions for meeting TSCA regulations, vastly simplifying the compliance process for any professional responsible for these procedures in the chemical industry. Complying with TSCA Inventory Requirements promises to streamline the standardization process of compliance like never before. CHAN B. THANAWALLA, PhD, is a chemist with several years’ experience in industrial organic chemistry and TSCA compliance of organic chemicals and silcones. 2. Toxic Substances Control Act (TSCA). 2.1. Definition of Certain Terms under TSCA. 2.2. Provisions of the TSCA. 2.3. Who Is Subject to TSCA Compliance? 3. CAS Registry Numbers and TCSA Inventory Chemicals. 3.1. What Is a CAS Registry Number (CASRN)? 3.2. CASRN and TSCA Inventory Chemicals. 4.2. Bona Fide Intent to Manufacture (BIFM) Requests. 4.3. The Premanufacture Notice (PMN) Process. 5. Processes for Assessing TSCA Inventory Requirements. 5.1. Process for Assessing TSCA Inventory Requirements of a Chemical for Chemical Processors. 5.2. Process for Assessing TSCA Inventory Requirements of a Chemical for Chemical Manufacturers. 5.3. Process for Assessing TSCA Inventory Requirements of a Chemical for Chemical Importers. 7.1. 15 USC OO2601–2629 as Amended through 1996. 7.3. 19 CFR 144.21 through 144.28. 7.4. 40 CFR OO721.90 and 721.91. 7.5. Notice of Commencement Form (EPA Form 7710–56). 7.6. Premanufacture Notice (PMN) Form (EPA Form 7710–25). 7.7. Compliance Verification Form (CVF). 7.8. PMN and NOC Instruction Manual. 7.9. Polymer Exemption Guidance Manual. 7.10. The PMN Review Process. 7.11. Chemical Information Needed for Risk Assessment.